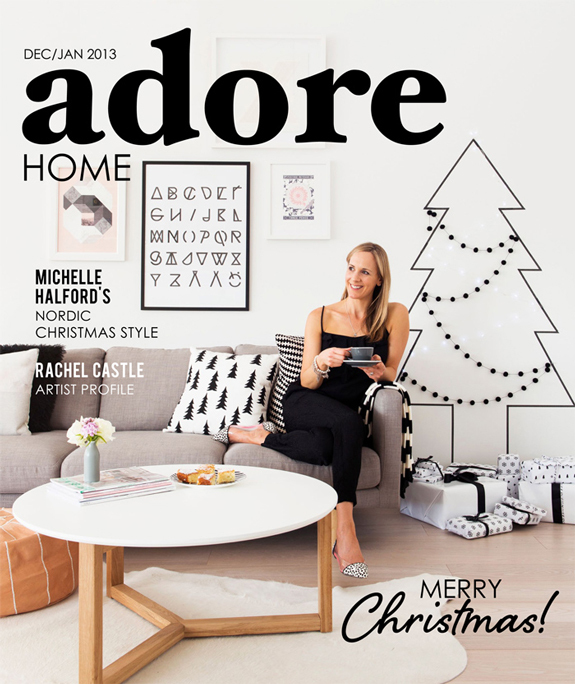 I love this spread in the latest Christmas edition of Adore Home! 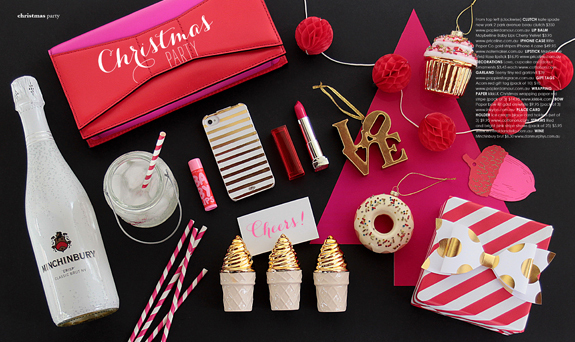 Hot pink, black and gold...delicious!! Loni has also included our Gold Paper Bow! Look at all those Inky Co. presents! Our wrapping papers are featured in the December issue of MARIE CLAIRE (page167 - 172) with Katie Perry on the front. And doesn't the spread look amazing! Unfortunately, as luck would have it, Marie Claire considered our wrapping papers, ribbons and accessories (which we donated to the shoot) to be props so we didn't get page credits. But! The amazingly lovelyPIA ANDERSEN (from VINTAGE ALLSORTS), who wrapped each and every one of these lovely presents, kindly sent through the pictures so I could show you guys. 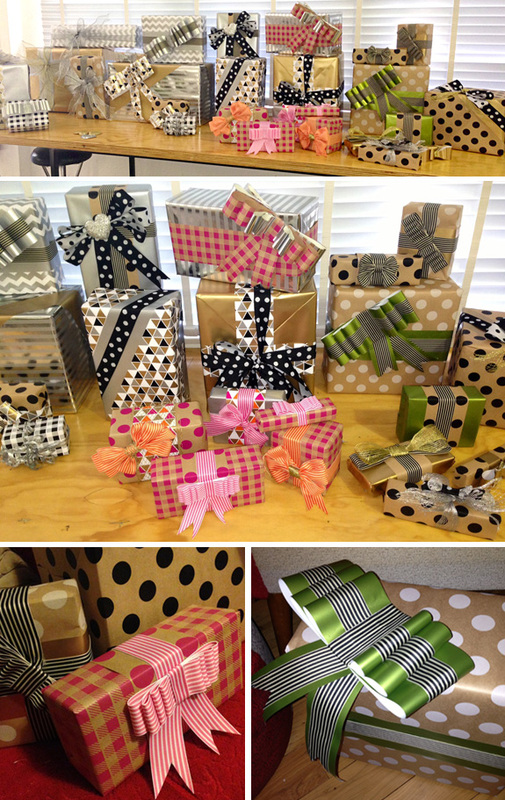 She also sent through some behind the scenes photos showing off her fantastic wrapping skills. PIA used a combination of LARGE WHITE DOT and LARGE BLACK DOT ON KRAFT wrapping paper in the picture above. 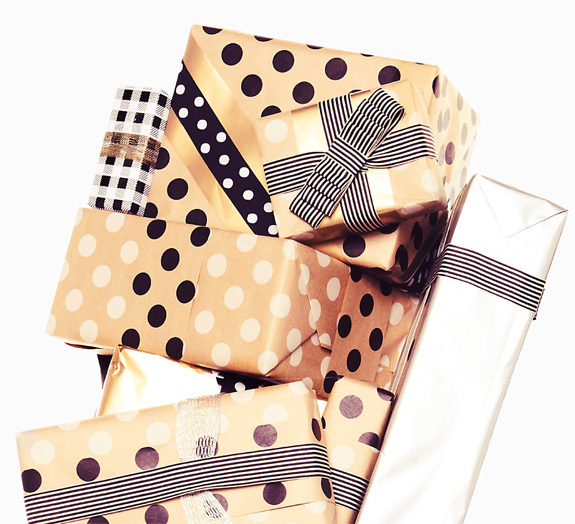 She also added presents wrapped in BLACK GINGHAM paper with our GROSGRAIN BLACK AND CREAM RIBBON, SPOTTED BLACK RIBBON and splashes of GOLD and PEARL WHITE. 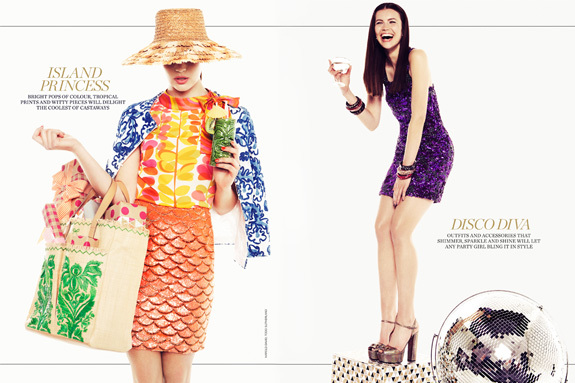 The Island Princess shoot features bold pops of colour. PIA has used our LARGE PINK DOT wrapping paper and GINGHAM PINK with a hint of TESSELLATE PINK. Disco Dive is all about our bold TESSELLATE BLACK (gorgeous!). 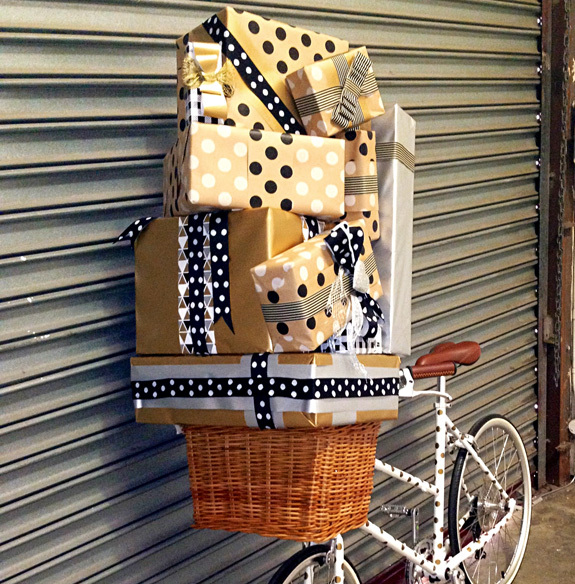 Marie Claire Your Go-To Gift Guide: Special Delivery - Photographed by HAROLD DAVID and TODD SUTHERLAND. Props styled by PIA ANDERSEN. Behind the scenes photos by PIA ANDERSEN.